Eau de Cologne du 68: created in 2006, by Sophie Labbe. When it was first launched, it was exclusive to the Paris boutique, but has been released in a 100ml size flacon, in limited distribution since 2008, in conjuction with Guerlain's 180 year anniversary. The fragrance is now sold only in the 250ml bottle. It is in all reality an eau de toilette in strength and concentration, though named a cologne. Cologne du 68 is a creation that plays with paradoxes and spurns traditional models. Its name recalls the legendary address of Guerlain, 68 Avenue des Champs-Élysées in Paris, and refers to its composition based on 68 raw materials. Fresh and spicy, it pulls you in with its contemporary facets, marked by the values of originality and quality so dear to the brand. The bottle with its clean lines is adorned with a precious wood stopper. Top notes: coriander, green mandarin, cardamom, petitgrain, lemon tree. Heart notes: orange blossom, pepper, everlasting flower. 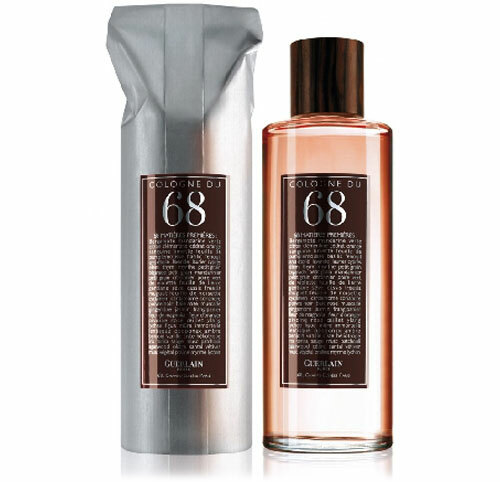 Cologne du 68 is directly inspired by Corsican landscapes: between the salty freshness of the seaside and the spicy warmth of the scrubland. At the heart of this fragrance shines everlasting flower and its incredible slightly syrupy scent. Between wood and resin, we also find honeyed yet salty dashes of fenugreek and anise aromas. So what does it smell like? It is a citrus aromatic fragrance for women and men. As of 2016, Guerlain has discontinued the Cologne du 68 fragrance.